General Motors India has given the Chevrolet Enjoy a mild facelift in a bid to boost the MPV’s image in the market. The majority of the updates have been made to the interiors while the exterior updates are barely noticeable. This the first update that has been carried out by Chevrolet since the Enjoy’s launch. 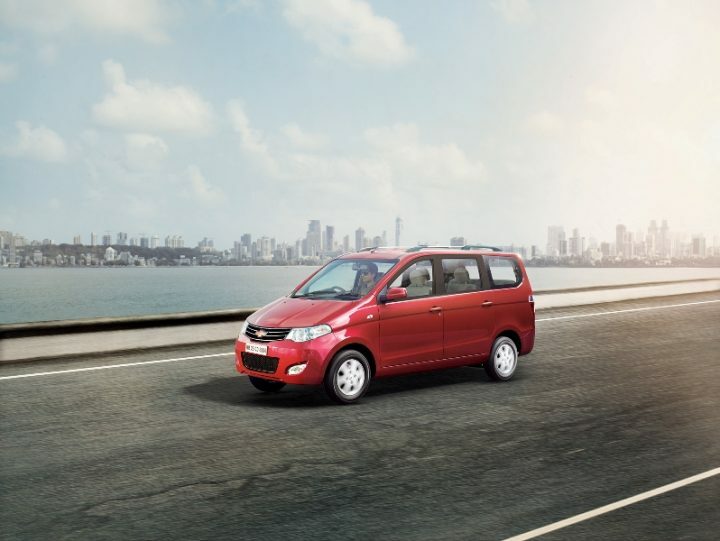 Although the MPV has been performing decently in the taxi market, buyers looking for an MPV for personal use have given preference to the competition which includes the Maruti Ertiga, Honda Mobilio, Renault Lodgy and Toyota Innova. 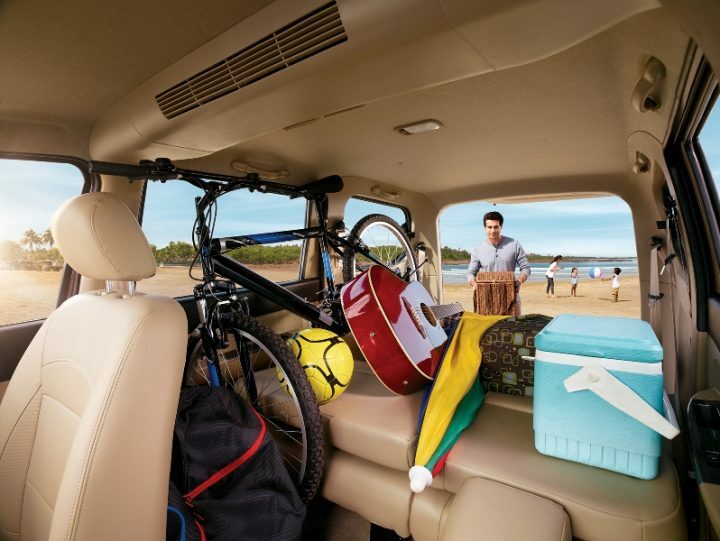 The facelift aims to enhance the Enjoy’s appeal as a personal family car by adding some premiumness to the cabin. Read on to find out all the details regarding the New Model Chevrolet MPV price, pics, specs, features and details. 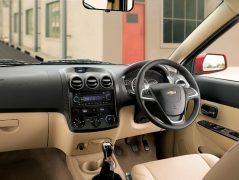 The new model Chevrolet Enjoy now starts at INR 6.34 lakhs (ex-showroom, New Delhi). Talking about its competition, the Maruti Ertiga starts at INR 6 lakhs (ex-showroom, New Delhi) and the Honda Mobilio starts at INR 6.75 lakhs (ex-showroom, New Delhi). New three spoke steering wheel with golden Chevrolet bow-tie insignia and silver accents as oppossed to the previous all black steering wheel. Chrome embellishments are added on the inside door handles, AC vents, gear knob and parking lever along with a glossy black finish on the door armrests. New leatherette and fabric upholstery. Chrome garnish in the rear license plate area. Enjoy is available in six colours: Velvet Red, Switchblade Silver, Summit White, Caviar Black, Linen Beige and Sandrift Grey. Engine line-up and other mechanical features have not seen any change. The new model Chevrolet Enjoy continues to be powered by a diesel and a petrol engine- 1.3 litre diesel producing 74.8 PS power and 172.5 Nm torque, 1.4 litre petrol producing 100.2 PS and 131 Nm torque. Both power units are mated to a 5-speed manual transmission. Fuel efficiency figures for the petrol and diesel versions are 13.7 kpl and 18.3 kpl respectively. Chevrolet currently sells two MPVs in India; the Enjoy and Tavera. Both vehicles have not managed to strike a chrod with family car buyers and are majorly sold to fleet owners. However, GM has a new MPV in the pipeline for India, called the Spin, which is expected to hit showrooms some time in 2016. The Spin will be a more premium offering and will be better equipped to take the fight to the Maruti Ertiga, Honda Mobilio, Renault Lodgy and Toyota Innova. Stay tuned to CarBlogIndia for more on the new model Chevrolet Enjoy and other automotive news.